The 2018 Easton S750C and S750 are USA Bats exclusive to Dicks Sporting Goods (although now you can buy them on Amazon). They are legitimate options in the mid to lower range performance space that should be considered dialed back versions of the Easton Beast X Hybrid and Jump to the full review. We aren’t the only ones to have information about the S750C. Other places, in particular those who sell bats, usually have a boiler plate write up on the specs of a bat. Many of those we reference to make sure we are seeing what we should be. Here are some more references for the 2018 Easton S750C review. Reviews delivered about every week. They are legitimate options in the mid to lower range performance space that should be considered dialed back versions of the Easton Beast X Hybrid and Easton Beast X. Each is less expensive than their respective Easton top end counterparts, loses a higher grade aluminum in the barrel and, in the case of the 750C, uses an older composite handle. That said, like many USSSA and USA Bats, it weighs more than its stated weight. Scale weight and swing weight are different things, but even the swing weight on the S750 is high compared to its “drop 10” counterparts. This bat should be considered a drop 8. For the price, and considering the limited hybrid options in the USA Bat space this year, we like the two piece hybrid S750C USA Bat. Those looking for a more reasonable price in the hybrid bat space should really consider it. The S750 is just fine, but we don’t think it anything to really go out of your way (since you’ll have to considering these are only found at Dicks) to track down. There are several inexpensive single piece aluminum USA bats on the market for less than $100. Try our best cheap USA Bats for some ideas. In the vast majority of cases we would recommend the S750C hybrid over the S750 single piece. Those only playing a very few games (sub 15), or those who know they prefer a single piece over a hybrid will prefer the S750. Maybe more important, the Easton Beast X comes in a number of different drops while the S750 only comes in a drop 10. The drop, you should know, is the numerical difference between the length of the bat in inches and the weight of the bat in ounces. So, a drop 10 S750 that is 31 inches should weigh 21 ounces. The fact the Beast X comes in more drop sizes (like a drop 5 and drop 8) makes it more attractive to a larger audience. Note, too, the Beast X has a drop 12 version referred to as the Hyperlite. The Hyperlite Beast X is a 2 1/4 barrel bat and, if you can, we suggest you avoid it. 2 1/4 barrels make very little sense on the USA Bat standard. The S750 is made from a single piece of aluminum while the S750C is a two piece hybrid bat. Hybrid bats consist of a composite handle and an aluminum barrel connected by some bat welding technology. The connective tech’s entire purpose is to keep vibration out of the handle on mishit balls. Most younger players, especially in the drop 10 space, benefit from smoother feeling hits and mishits. It is why the vast majority of them prefer two piece bats and, in this case too, the S750C over the S750. We think it worth the $50 difference in the vast majority of cases. The barrel’s on the S750C and S750 are identical. They use an HMX alloy, (the same aluminum alloy Easton uses in their high grade BBCOR bats). They also both use the same grip that is also found on Easton’s top end youth USA and big barrel bats. That connective piece and composite handle addition is the driving force between the price movement of the S750C to the S750. The major difference between the S750 and Easton Beast X construction is the newer alloy (ATAC) used in the Easton Beast X. The newer alloy allows for a longer barrel profile than that in the S750. 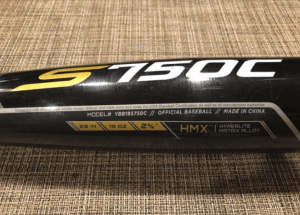 The S750 uses Easton’s older alloy referred to as HMX. That X in the name refers to the eXtended barrel the ATAC makes possible. If you have yet to notice, several major vendors are negotiating exclusive bat deals with major manufacturers. Most times these exclusives are simply colorway iterations of otherwise well received bats. But, more and more, entire models of bats are getting released by only one outlet. JustBats.com, as one example, released a much anticipated drop 10 CAT 7 from Marucci that is exclusive to only them. Although previous year’s models of the S750 line from Easton could be found elsewhere, the 2018 S750C and S750 are Dicks Sporting Good’s Exclusives. Exclusive deals are the last major leverage major vendors need to capture to stay viable. As smaller bat sites and social media put price pressure on major vendors, they must create truly unique offerings to justify price and keep margins for the long run. We are confident the S750, S750C and CAT 7 are not the last of exclusive and top end bats you’ll see only available at certain outlets. My 9 year old son’s 29/19 S750c weighs 22 ounces. Absolutely ridiculous. How does the weight of the 750c compare to the Beast X Hybrid? It compared well, although it uses last year’s aluminum. Barrel not as big either. But, for the price, the 750 is hard to pass up, we think.